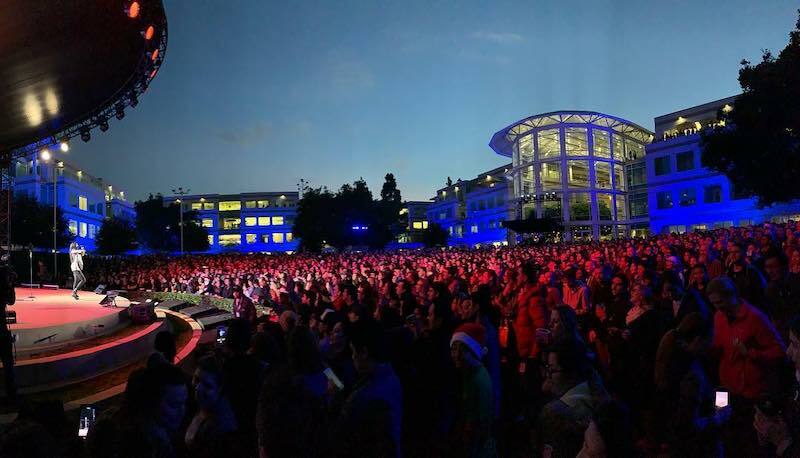 Apple celebrated the holiday season today with a live performance by award-winning singer Idina Menzel, who sang a handful of songs from the Disney animated film Frozen, including the soundtrack Let It Go. "A big thank-you from our Apple family to the phenomenally talented Idina Menzel," tweeted Apple CEO Tim Cook. "Your voice is a gift — thank you for sharing it with us. What a wonderful way to celebrate the holidays!" The concert took place at Apple's Infinite Loop campus in Cupertino, California during its recurring Beer Bash employee gathering today. Apple today also hosted its annual celebration of Toys for Tots, a program run by the United States Marine Corps Reserve, which distributes toys to children whose parents cannot afford to buy them gifts for Christmas. Last year, Apple's holiday Beer Bash featured a live performance by singer Gwen Stefani. It's Christmas Timmy. You can't even say it can you? It's not Kawanza (that's a complete farce), it's not Hanukkah. It's CHRISTMAS. It's the reason FOR the season. Some places and cultures that’s true, now get over yourself, Apple is a global company. Only the Western people care about this nonsense thinking. Here in East Asian countires with the low percentage of Christians, we are free and willing to say Christmas every year. What holidays is Cook referring to? Might want to look up the history of that. Has nothing to do with Christ. Christianity took it and renamed it to Christmas. Makes sense, considering the fact that nearly EVERYONE celebrates the holidays, yet... even with its umpteen factions & myraid branches- still, less than 1/3 of the population is Christian. If you don’t add a /sarcasm tag... I’m totally going to pretend like I don’t realize you’re trying your hand at sarcasm. I just don’t get why they’re not ok with saying and wishing Merry Christmas but then are ok with mentioning Hanukkah, Eid Mubarak, Diwali, Chinese New Year, etc... This Nonsense must stop. Well, it’s Hanukkah NOW (I’m particularly looking at you, Naraxussy: it is Hanukkah). It’s not Christmas for another two and a half weeks. You want people to ignore Hanukkah on Hanukkah and wish everyone Merry Christmas? In poker that’s called a tell.